1. Halve the avocados length-wise; pit and peel. Slice a thin layer from the rounded bottom of each half so that it sits flat. 2. In a small bowl, combine the tomato, cilantro, scallion, jalapeno, lime juice, 1 teaspoon oil and 1/8 teaspoon salt. Add salt to taste if necessary. 3. Heat the grill to high, lining with foil if needed. Brush avocado halves lightly with oil; grill 1 minute a side, until lightly charred. 4. 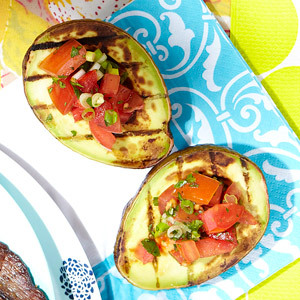 Place avocado halves on a platter; spoon tomato salsa into wells. Serve immediately. PER SERVING: 141 cal., 13 g total fat (2 g sat. fat), 8 g carb. (5 g fiber), 2 g pro.